4 assorted metallic colours: Red, Blue, Green & Purple. The writing width of the nib is a 4mm bullet tip. The ink is waterbased and of archival quality and acid free. 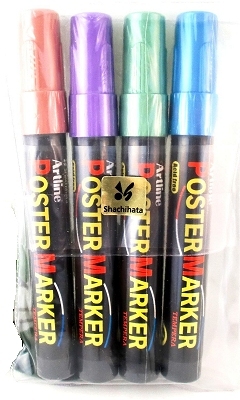 The ink is waterproof and fade resistant and it can be used for craft projects, sign writing and as a graphics marker on paper, metal, plastic and glass etc.